There are a couple of very powerful attack strategies at Town Hall 8 and undoubtedly GoVaLo is one of them. I will try to make this guide as simple as possible so you can easily understand and use GoVaLo. When should I use GoVaLo composition? If you’ve had no luck/passion with those mentioned strategies, you should give this strategy a shot! Due to the Valkyrie’s special ability (she can deal splash damage to units within a 1 tile radius), the ideal bases of GoVaLo are ones that have serried buildings and Air Defenses inside the core especially in the core. She is one of the most powerful troops at Town Hall 8. Also, she is one of the most useful troops at TH9. 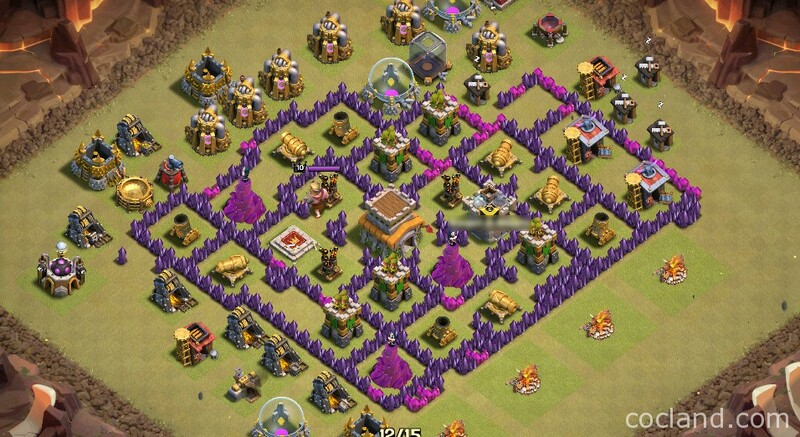 By using this strategy at TH8, you will have lots of good practices for the future attacks. As usual, there is no perfect army composition for GoVaLo. Depending on the base you are going to attack, choose the best composition for you! I recommend using Golems and Valkyries at least level 2. Golems level 1 are really weak as they can’t soak much damages for tanking. How many Valkyries I should use? 5-8 Valks are great but truly you shouldn’t count the Valks. You should count the amount of Balloons you need. I usually use 10-13 Balloons but If somehow you need more, maybe you should use another attack strategy. Use the Kill Squad (Golems + Wizards) and your Valkyries to get into the core. Try to take down at least 1 Air Defenses. Destroy the core and take attention from the outer defensive ring. Backend Balloons will destroy those outer defenses. 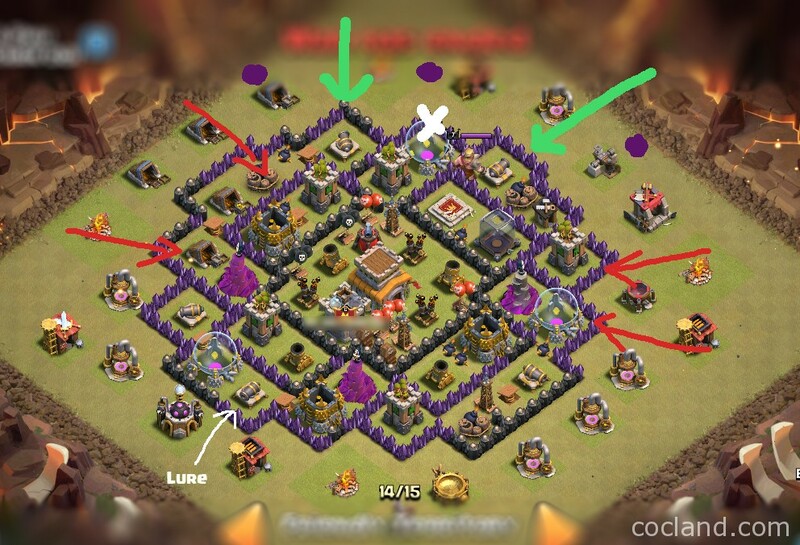 Firstly, the most important thing you should pay attention to before attacking with GoVaLo is the enemy Clan Castle troops. Giant Bombs, the enemy King and the point defenses aren’t much of a danger, but just a couple of defensive troops can ruin your attack anytime. If the enemy Clan Castle is exposed, drop 1 Giant/Hog or Balloon to lure then out. If the enemy Clan Castle is centralized, send about 3 Balloons or Hog Riders inside. They will lure the defensive Clan troops out while attacking the enemy defense. After luring them out to a corner, group them, and drop the Poison Spell to take them out. If some troops (Dragons, Balloons,..) survive, drop 2-3 Barbarians. When the Dragon and Balloons are chasing your Barbarians, deploy 4-5 Wizards right behind the Dragon to quickly take it down. If the Dragon kills your Barbarians before it dies, deploy 1 more Barbarians right below its face as you can see the screenshot below! 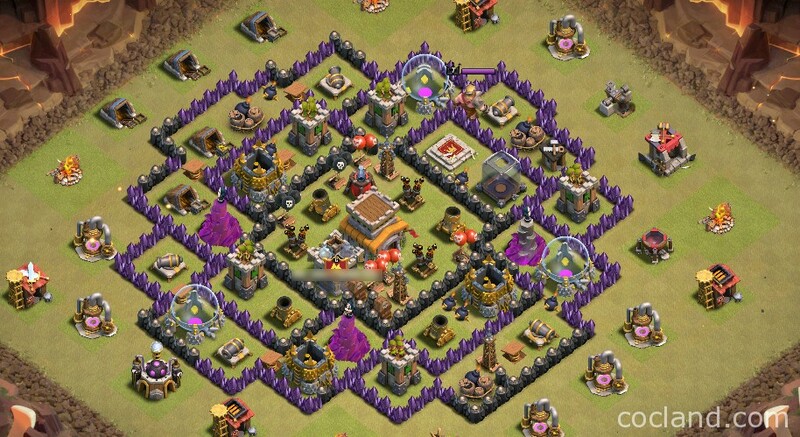 Also, you should lure Clan troops to the side where you start attacking. We should attack the compartment which is close the core, so your troops will not go shopping around and spend a lot of time before breaking into the core. Let’s take a look at the example below! X mark = Wall Breakers. After the first step, do not wait for your Wizards and quickly deploy the Golems into the battle. As you can see in the screenshot above, I will attack from the compartment with the X mark because my army can get into the core easily from there. Take a quick look, and deploy your Minions on Builder Huts at the corners and buildings, which are protected only by ground defenses. After deploying the Golems, the Wizards will take down outside buildings quickly without being hit. This is an important step for funneling your Barbarian King and Valkyries inside the base; otherwise they will go shopping around the base. Valkyries are much easier to control than P.E.K.K.As so I don’t think you will have any problem. Once the Wall Breakers have exploded, the Golems will go inside through the broken Walls to the Archer Tower and then into the core. It’s time to send the Valkyries in the battle. Simply drop your Healing Spell and Rage Spell once your troops have entered the core. It just takes a couple of seconds to take down all defenses in the core compartment. Once at least 2 Air Defenses are down, you can send your Balloons into the battle. Send 3-4 Balloons for each defense and attempt to focus on Air Defenses, Wizard Towers and Archer Towers. 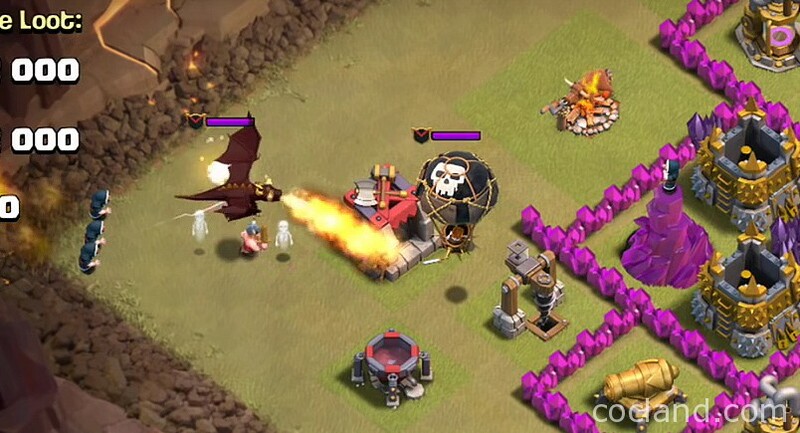 Most defenses would be locked on your Golems, Barbarian King and Valkyries so your Balloons can finish their job easily. By sending mass Balloons, you can oppress the enemy base within seconds. How to use the Earthquake Spell? It’s also not hard to use the Earthquake Spells. Drop a pack of 4 Spells on any junction that link to the core and your army will find the right way. There is a detailed guide about this spell on cocland, you can take a look at here. They are used on the inner walls to allow access to the core. Try to open as many compartments as possible with them. If the base you want to attack has 3 layers of walls, use Wall Breakers to take down the first layer. You need to pay attention to the Mortar fireball since it can take down your Wall Breakers anytime and the battle might end up badly. 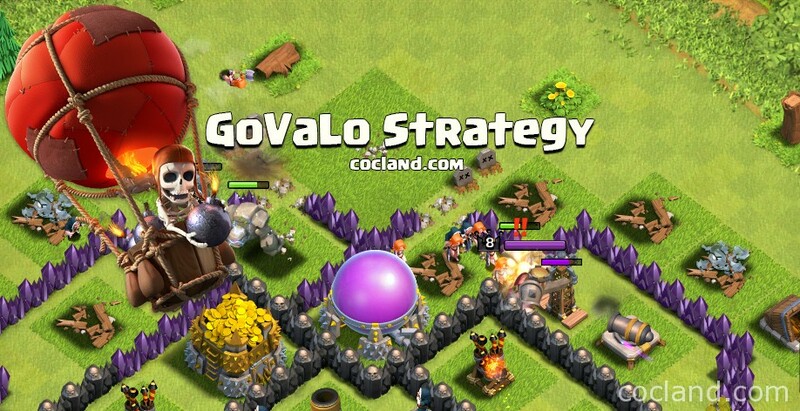 I hope you can bring more stars for your Clan with the GoVaLo strategy!